For nearly three years, Syrian, Russian and U.S. war planes have maintained an uneasy truce over Syria — a truce that progressively frayed early-to-mid 2017. But the main parties had so far refrained from engaging each other in air-to-air combat. That all changed at 6:00 in the evening, local time, on June 18, 2017, when a U.S. Navy F/A-18E Super Hornet fighter shot down a Syrian air force Su-22 attack jet — the first manned airplane the United States had shot down in aerial combat since 1999. Earlier at around 4:30 that afternoon, Syrian ground forces attacked the Kurdish-led Syrian Democratic Forces in the town of Ja’Din, south of the city of Tabqah. SDF forces had captured Tabqah from Islamic State on May 10, 2017. Only 34 miles away from the ISIS capital of Raqqa, Tabqah is a staging ground for the ground assault on the ISIS capital. The Syrian government attack on June 18 wounded several SDF fighters and caused them to withdraw from the Ja’Din. Coalition fighters then performed a “show of force” to dissuade the attackers. This was likely a low-level overflight of the Syrian troops. One month earlier on May 18, 2017, U.S. aircraft performed a show-of-force over a Syrian armored column advancing toward an SDF training camp. But the column kept rolling, so the U.S. jets attacked, destroying a tank and some construction vehicles and forcing the convoy to halt. Then on June 8, a Syrian drone — likely of Iranian manufacture — launched a failed attack on rebel forces being trained by U.S. advisors. A U.S. Air Force F-15E Strike Eagle fighter subsequently shot down the drone before it could release additional weapons. The initial aerial show of force on June 18 was reportedly successful in causing the Syrian forces to disengage. Afterward, U.S. forces communicated with their Russian counterparts via their shared “deconfliction hotline” in the hope of de-escalating the situation. 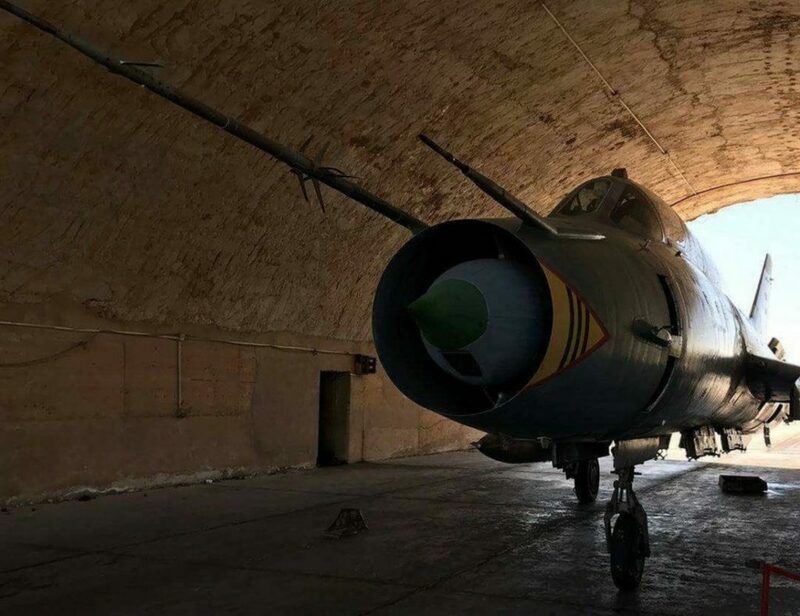 The Su-22 is the workhorse of the Syrian air force. It’s a large, fast, swing-wing ground-attack plane. Though capable of carrying heavy bomb loads, it can only employ short-range air-to-air missiles and its cannons in aerial combat. It would have been easy prey for the more advanced Super Hornet fighter, which boasts a powerful radar and long-range AIM-120 air-to-air missiles. In fact, the Su-22 the Americans shot down on June 18 was not the first Su-22 destroyed by coalition forces in Syria. On April 4, 2017, Syrian Su-22s dropped chemical munitions on the Syrian city of Khan Sheikhoun. In retaliation, Pres. Donald Trump ordered a Tomahawk cruise missile strike on Shayrat airfield, where the Su-22s were based. Although Moscow claimed that no Su-22s had been hit in the missile strike, photographic evidence subsequently revealed that at least four of the planes had been destroyed. The aerial clash on June 18 could further strain the uneasy truce between the U.S.-led anti-ISIS coalition and Syrian government forces backed by Russian air power and Iranian advisors. The United States has strengthened its alliance with the Kurdish-led SDF as the rebel army embarks on a ground offensive to capture the ISIS capital of Raqqa. Syrian ground crew arms an Su-22. Photo via A.V. At the same time, the Syrian government forces have launched more and more attacks on SDF troops in the last month. Fighting between the two had previously been limited because the SDF focused on fighting ISIS, while the Syrian government concentrated on crushing moderate rebel groups that posed a more direct threat to the regime. Now that both ISIS and the moderate opposition are meeting defeat after defeat on the battlefield, Damascus appears to be seeking out confrontations with the Kurds. For now, the U.S.-led coalition is doing its best to downplay the consequences of the aerial skirmish. It remains to be seen how this incident will impact Russia’s ongoing aerial operations over Syria. In November 2015, two Turkish F-16 fighters shot down a Russian Su-24 bomber after it briefly crossed into Turkish airspace. The incident led to a sharp — though short-lived — decline in Russian-Turkish relations, and ultimately led to the establishment of the de-confliction process to avoid future incidents. Unfortunately, the de-confliction process today was clearly ineffective. “The coalition calls on all parties to focus their effort on the defeat of ISIS,” U.S.-led forces stated. However, even as ISIS forces appear on the verge of defeat in both Syria and Iraq, the truce between the anti-ISIS coalition, the Syrian government and Russia seems more fragile than ever.